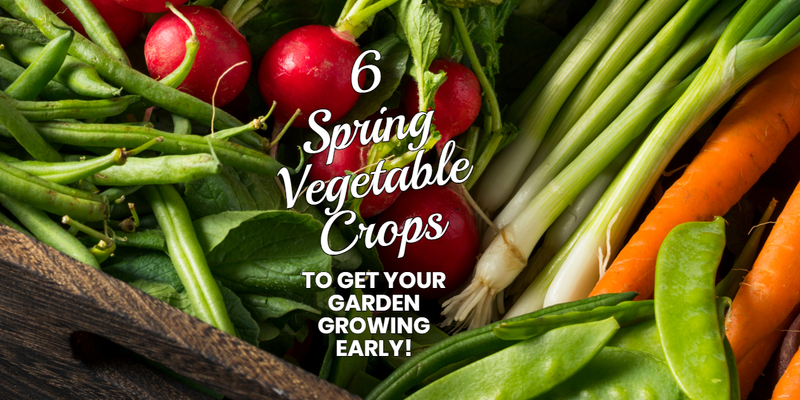 There is no need to wait until summer – get your garden season off to an early start this year by growing a few cool-weather spring vegetable crops! Many vegetables actually grow better in the cooler temperatures of spring. In fact, they thrive in it. Early spring is a great time to get your hands in the dirt by planting a few seed crops. Some crops can be planted as early as 4 to 5 weeks before the last spring frost. Now that is growing early! Here is a look at 6 great spring vegetable crops to get your garden season off to a fast start this year. Loose-leaf lettuce is one of the easiest spring vegetable crops to grow. And one of the fastest to mature too. Loose leaf lettuce germinates quickly. And many varieties can be harvested in as little as 28 days. Even better, it can be harvested multiple times – keeping you in fresh salads all spring long. Lettuce seed can be sown as soon as the ground is workable. It performs best in loose, fertile soil that drains well. Sow seeds directly into the soil about 1/4″ deep and an inch or so apart. Lettuce can take cool temperatures, but should be covered if a hard freeze is expected. Continue seeding every 2 to 3 weeks for a continuous supply of fresh salads. Here are a couple of great favorites to try : Parris island Lettuce Seed, Black Seeded Simpson Lettuce Seed. Kale is one of the most nutritious crops that can be grown in the garden. It’s beautiful leaves are loaded with a slew of vitamins and nutrients. Cooler temperatures enhances the flavor of Kale. The flavor of kale actually improves in cooler weather, making it a perfect early season crop to plant. Kale can be sown 4 to 5 weeks before your areas last frost date. Plant seeds ¼-inch deep, spacing two inches apart. As they grow, thin to 4″ between each plant. Once the summer heats begins to set in, Kale will begin to lose it’s flavor and bolt. When the cooler temperatures of fall arrive, it can be planted again. Radishes are one of the fastest growing seed crops you can plant in the garden. Looking for a super-fast grower in the garden? Radishes can go from seed to table in about a month. They are perfect as a healthy snack, or adding great flavor and color to salads. In fact, they can be on the table in as little as one month after seeding. Radishes come in all sizes and shapes and in a wide range kinds of flavors. From mild to hot and everything, there is a radish that can fit the bill. Plant radish seed 1/4″ deep in fertile, loose and well-drained soil. The finer soil helps them to grow to size and shape quickly. Thin once seeds sprout to allow the radishes to keep from tangling together. Radishes like consistent moisture, so keep watered if experiencing prolonged periods without rain. Plant every 2 weeks to keep a fresh supply growing from spring to fall. It’s hard to beat the taste of fresh spinach. Especially home-grown baby spinach! Whether using in salads or cooking lightly to perfection, spinach is a power crop of healthy goodness. Tender young spinach growing in the garden. Spinach seeds can be sown directly into the soil about 2 weeks before your areas last frost date. Plant seeds 1/4″ to 1/2″ deep every few inches. As they mature, thin to 3″ between each plant. Here are two great favorites to try : America Spinach Space and Corvair Spinach. Spring onions are a fantastic way to garden early! And, they are simple to grow in the garden, or planted in raised beds or containers. Spring onions freshly pulled from the ground. Sow seeds 3 to 4 weeks before your last frost date. Plant at a rate of one per inch, about 1/2″ deep into the soil. Some varieties can be ready to pick in as little as 60 days. A great variety to try is Warrior Bunching. One of the healthiest snacking vegetables around are snow peas. Sow seeds as soon as the soil can be worked. Plant a few inches apart, 1/2″ to 3/4″ deep in the soil. Peas need a steady supply of moisture to produce, so keep well watered.